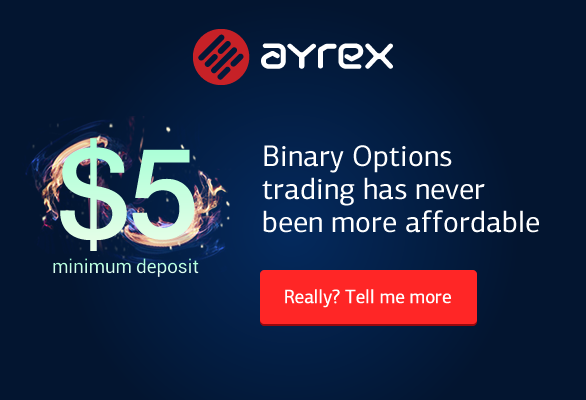 Ayrex is taking binary options trading to the next level. Its high tech trading software is incredibly good, with a clean and user-friendly interface. Traders can claim up to 185% returns on "the fastest platform in the industry". Why not try it for yourself? You join demo contests and win real money just for signing up! If you've tried binary options trading before, you know how important it is to trade on a fast platform. The price of any asset can change every second during trading hours, and just one pip can decide whether you win the trade and double up, or lose and end up with nothing. Ayrex has a trade execution time of just 0.028 seconds on average. Yeah, that's fast! It also has a 99.95% server uptime record, so you'll never have to worry about losing your connection right before making a trade. If you don't have any experience with binary trading, Ayrex is a great site to learn on. It offers a free demo platform with a $1000 balance and no sign up is required! There are also 3 free demo contests held each week, where users compete for $3600 in prizes and pay no entry fee. These "Binary Blast" contests are not too complicated either, lasting just 1 hour each. Ayrex uses its own software. There isn't any skins or co-brands offering this quality platform anywhere else. You'll only find it at Ayrex. Not only is the platform great for trading, but it's also integrated with tabs for the latest market news and trading signals. You get everything you need all in one place. This powerful software is HTML5, so it can be loaded on your PC, tablet, or mobile device. GooglePlay and Apple Store apps are also available. There are over 70 instruments available to trade on Ayrex. Users can open a trade for as little as $5! All of the major currencies, indices and commodities are available to trade. There is also a solid choice of stocks, such as Yahoo!, Twitter, Nike and Porsche. All assets can be traded as either short term (between 30 secs and 5 mins), high/low, or one touch. Ayrex is a relatively new brand to the binary options scene, but it has some policies that indicate there are some experienced minds behind it. For example, all deposit bonuses have a "no lock" policy. Traders always have the option to cancel their bonus and claim the deposit back. Their anti-money-laundering policies are strict, requiring users to upload documentation to prove their identity, but the process moves quickly and efficiently. Once an account is verified, the owner can make withdrawals within 1 hour! Getting started with Ayrex is extremely simple. The sign up form has just 4 fields: name, email, country, and password. You can also sign up using your Facebook or Google account. Get started now!